Arrow celebrates its 150th episode with a slight alteration in format and a suggestion for how the show moves forward. The documentary format has been used here and there in TV shows to offer different insights into the characters. The Simpsons “Behind the Laughter” is the only one that springs immediately to mind but I’d say that’s a perfect example of taking something familiar and completely turning it on its head through a shift in format. “Emerald Archer” is at first disappointing because it doesn’t fully commit to the documentary style which makes it feel like something of a gimmick intruding on what amounts to a fairly standard episode of Arrow. It starts off really well with candid interviews from characters past and present and blurry at distance looks at the various vigilantes that have cropped up on the show over the years but quickly abandons that in favour of returning the viewer’s perspective to the norm. I can’t stress enough how much of a missed opportunity this is considering the focus that has been given to public opinion of vigilantes and the effect they have on society by their very existence. A documentary by itself doesn’t deliver an answer to what the public thinks of vigilantes as such but the questions being asked and how the answers are framed give an idea of the sorts of things that people want to know. Keeping the camera far away from the action could have been really effective as it serves as a reminder that there is a world outside Team Arrow, the S.S.P.D. and A.R.G.U.S. It’s that thing I like to call scope and this was the perfect way to give the show that scope if only the documentary style had been fully committed to. Dropping in and out of the documentary only served to highlight some of the problems that format has on a show like this. 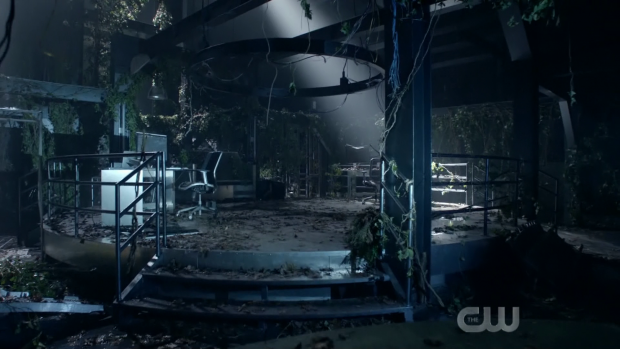 If it had been a self contained documentary style episode with the ending scene featuring Blackstar and Connor Hawke (Joseph David-Jones) -last seen in a season 1 DC’s Legends of Tomorrow episode– allowing a lot of these problems to be handwaved away as they would somewhat be answered by the footage being viewed in a future where the documentary itself had a part to play in creating the future we’ve seen glimpses of all season. Part of what ruins the format is the change in style whenever characters have an off the record conversation. Seeing those conversations alters the format completely because it has to since it makes no sense for the characters to allow them to be recorded but it ultimately harms the episode as it’s unclear what it’s looking to achieve by running two distinct formats alongside one another. Adding in normal format conversations separate from the documentary style ends up drawing attention to some of the more questionable decisions. The most glaring is cameras being allowed inside A.R.G.U.S. as they are discussing confidential operations. There is no acceptable justification for Curtis getting away with casually blurting out the existence of top secret satellites in front of a camera crew. A more effective way to do that would have been the documentary asking an open question about the extent of Oliver’s resources and his connection to John Diggle who was once apparently his bodyguard and is now an A.R.G.U.S. agent. In this case the lack of public knowledge could have been an asset because these are the sorts of questions people might ask when they have some of the story but not all of it. It’s also worth noting that Emiko is captured on camera in costume and unmasked which doesn’t seem to actually have any impact on those making the documentary or the police officers present at the time. Once again if this was entirely in the documentary format being viewed from the future then this wouldn’t have been as significant but the shifts in format make it stand out. Another problematic part of the episode is the villain. If this were a documentary case study on the impact of vigilantism on the sort of threats that have become the norm since the emergence of the Green Arrow then it would have been fine but the shifts in format only draws attention to the fact that no effort has gone into developing the villain at all. There’s a half baked explanation of his backstory that is swiftly dismissed. 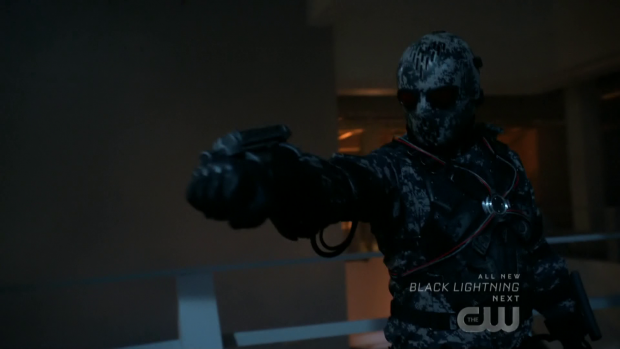 In theory the idea of a vigilante criminal taking visual elements from many members of Team Arrow as a part of his identity is an interesting idea given the subject matter but nothing is done with it. The documentary itself ties into one of the major themes of the season. Transparency has come up a lot over the lifetime of the show as relationships have been threatened by rampant secrecy. Oliver has made a commitment to being open and honest with his friends, his family and the people of Star City. The fact that he openly contents to being interviewed for a documentary and delivers an honest account of his experiences reinforces that theme and gives a different perspective on Oliver’s sincerity. Even though breaking with the documentary format is a missed opportunity it is at least used well. Oliver and Diggle reflecting on the fact that they haven’t actually spent much time together since his release from prison and catching up on the Emiko situation was great as it highlights how much has changed from them on a personal level because of the paradigm shift caused by Oliver outing himself and going to prison. Friendships naturally go through stages and circumstance has dictated the current state of their friendship where they barely speak and have completely different responsibilities. Diggle longs for the days where they fought side by side and Oliver would confide in him before anyone enable but at that point of the episode there’s no way for them to be aligned. 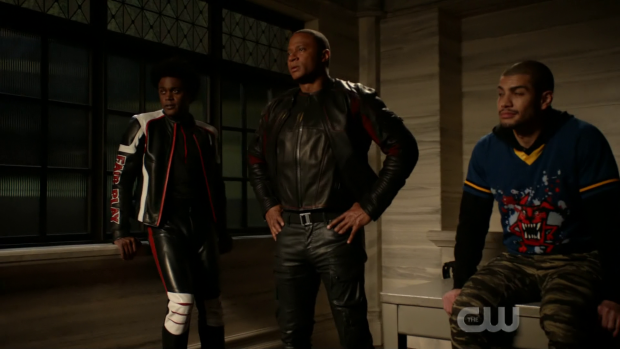 This changes when Diggle suggests getting the team together for one last mission in order to bring down Chimera because he sees it as the right thing to do. They achieve what they set out to do but it comes at the cost of Dinah being outed as Black Canary and the rest of the team being arrested for breaking the law by suiting up. It’s a less than ideal situation but a good opportunity to reinforce how strong the bond between the team is. Oliver -after an unseen discussion with his family- chooses to turn himself in because he feels responsible for Team Arrow coming together once again and refuses to let them take the fall while he goes free. It answers his own crippling sense of self doubt exemplified earlier in the episode when he supposes that he wasn’t capable of leading a team because of all the mistakes he made. Diggle is there to help him realise that everyone makes mistakes and learning from them is what makes him a better person. Ultimately he proves how capable a leader by stepping up and taking responsibility for his team by offering to take the fall with them. Bizarrely the end result is having them all deputised which doesn’t entirely add up but the sentiment is good enough and having Team Arrow as an extension of the police is probably the best way for the show to make use of its current status quo while still having the costumed adventurer trappings that bring audiences back episode after episode. It would probably make more sense for them to be a resource for A.R.G.U.S. as it would certainly be more reliable than the Ghost Initiative/Suicide Squad and still fulfil the quota of being under some kind of oversight. Still, deputising the entire team is seen as a good thing for all concerned as shown by Oliver pledging to rebuild the Bunker better than ever as a symbol of team solidarity. Countering this hopeful finish by showing the Bunker once again in ruins in the bleak future is really effective and serves as a sobering reminder that there is no happy ending to be found at the end of this road. William’s return has both advantages and disadvantages as far as this episode goes. It clashes with the future storyline in a way as there was an implication that William didn’t see Oliver or Felicity again after leaving for boarding school though it’s possible he meant after this particular break period. The younger version of William will have to be written out of the show at some point assuming the bleak future is supposed to come to pass though I’m far from convinced that will happen. There seems to be a lot of plot to burn through for William such as dealing with his expulsion. This feels like it comes out of left field as there’s no way a school would expel someone without contacting their family to inform them. It’s possible that William was somehow able to intercept that communication given his clear technical skill but it’s a glaring issue that isn’t even addressed. Felicity being the one to discuss the situation with him and see through his tricks is a good idea because it gives those characters time to bond further which will in turn help their relationship in the future timeline by giving it a strong grounding but there’s a lot being skipped over here. Hopefully there will be more opportunity for him to interact with Zoe as that was a really charming scene made even better through Rene’s gobsmacked reaction. A compelling episode that makes good use of the documentary format but suffers from juggling that with a more traditional style when committing to it would have been more impactful. The documentary idea was a really good one as it allows the characters to be viewed from a different perspective and expand the scope of the show by bringing in a suggestion of the public opinion on Vigilantes at this point. Interviewing Oliver helps reinforce his commitment to sincerity in a completely different way and the viewer gets a sense of the sorts of questions people might ask about vigilantes. Sadly the episode wastes this opportunity by abandoning the format in favour of a more traditional style to give the viewer access to private conversations as per the norm. Not seeing those would have done things like leave open questions about the extent of Oliver’s resources based on what is currently public knowledge. Moving away from the documentary style also highlights weaknesses such as a weak villain, the lack of impact to Emiko’s face being seen by a camera crew as well as police officers and cameras being allowed inside A.R.G.U.S. at all. If the entire episode had been in this style the reveal that it was being watched by Shatterstar and Connor Hawke in the bleak future timeline would have had more impact. It wasn’t a bad reveal at all as it manages to underpin that there’s no happy ending at the end of this road. Breaking away from the documentary style throughout is at least used well. In particular Diggle and Oliver catching up after barely seeing each other since he went to prison is noteworthy. Friendships go through stages and the current stage of theirs has been dictated by circumstance. Oliver has had limited access to his main confidante because their current paths aren’t aligned and that loss is definitely felt. This leads to Diggle convincing Oliver to get the team back together to bring down Chimera which happens and ends with their arrest for breaking the law by suiting up. Bizarrely they end up deputised which doesn’t make a lot of sense considering A.R.G.U.S. would make more sense for Team Arrow while still fulfilling the need for legal oversight. Either way it’s seen as positive with talk of rebuilding the Bunker only to show it in ruins in the future timeline. William’s return has a lot of potential but glossing over his expulsion makes no real sense as no school would expel someone without contacting their family. It does allow his relationship with Felicity to develop which gives their connection a strong grounding to be taken forward into the future. His scenes with Zoe were also really charming made better by Rene’s reaction to it.